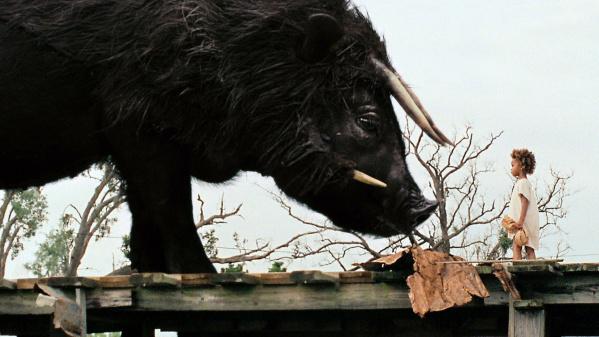 This year’s Sundance darling, Beasts of the Southern Wild, defies description. Part fable, part real-life, it could take place at almost any time in modern history, though the locale is so clearly defined ~ to the point of being a character in and of itself ~ that you can practically smell it, hear it, taste it and feel it. Beasts takes place in a Southern Louisiana Delta called The Bathtub ~ earning its name due to it filling up with water when it rains…and oh, does it rain, as if it won’t ever stop. The living conditions there are meager ~ dirty, cramped and infested with all manner of creatures (some real, some mythical), yet the “residents” of the Bathtub (an array of eccentrics who fit into no clear category) are fiercely devoted and attached (for better or for worse) to their home, refusing to leave, even when a storm reminiscent of Katrina makes their already dismal living conditions virtually unlivable and the government tries to forcibly remove them. 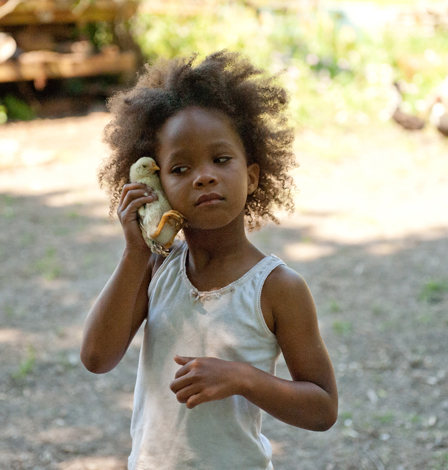 The story centers around an extraordinary 6-year-old girl called Hushpuppy (played by soulful newcomer Quvenzhané Wallis) and her distant, tough-loving father, Wink (beautifully played by another first-time actor, Dwight Henry) as they struggle to subsist amidst the many obstacles in their path: his failing health, the dangerous repercussions resulting from the aftermath of the storm, and their previous abandonment by Hushpuppy’s mother (an absence clearly felt by both). Although Wink often comes across as unfairly harsh, it eventually becomes clear he is only trying to teach his young daughter how to survive on her own, as her impending orphanhood draws ever near. 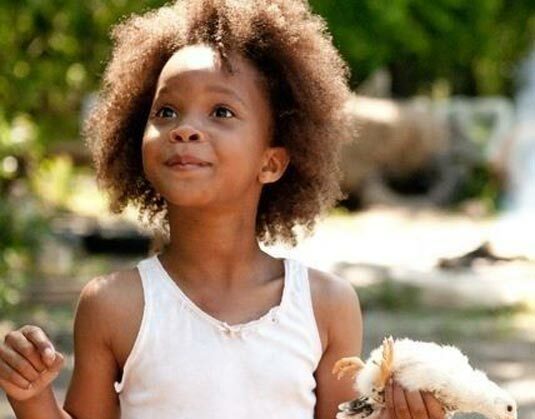 Hushpuppy, who affectingly narrate s the film from her point of view, goes about trying to make sense of the tenuous world around her, doing so with more courage, resolve, imagination and wisdom than most ten times her age. She is a force of nature, a wonder to behold ~ and one gets the sense that at the tender age of six, the line between “actor” and child is practically non-existent. It is she ~ with her touchingly delivered voice-overs, her steely and steady gaze, her tenacity, and her remarkable spirit ~ who brings a beating heart to the narrative, lifting the film to the heights it reaches. It is quite a load to carry on such tiny little shoulders, but she bears it with strength, stamina and grace. She is a firecracker, a revelation and alone makes the movie worth seeing. 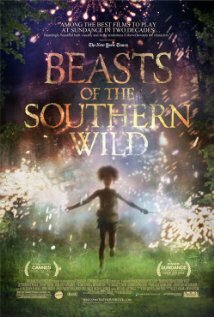 Apart from the two lead performances (in particular that of the young Wallis), I was left dumbfounded by the mind-blowingly multi-talented man behind Beasts of the Southern Wild. 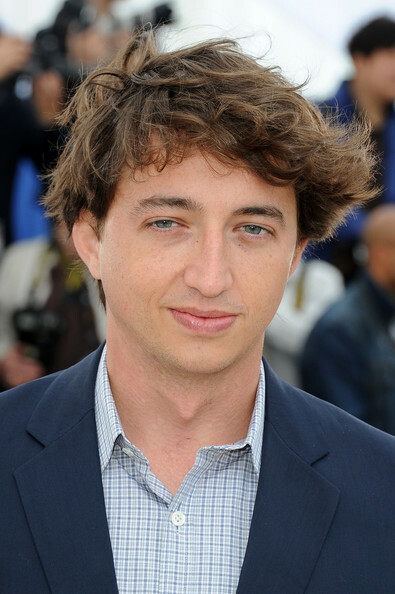 Not even yet 30, Benh Zeitlin directed, co-wrote the screenplay (alongside Lucy Alibar, based on her stage play “Juicy and Delicious”) AND co-composed the gorgeously sweeping score with childhood friend Dan Romer. I am in awe at the exceptional skill and capability he possesses in the wearing of all of those hats. He is undoubtedly someone to watch. (And for those of you who value her opinion, apparently Oprah agrees.) Please also click here to check out an illuminating piece with one of my favorite on-air journalists (Madeleine Brand) interviewing Benh Zeitlin ~ of particular interest are his comments on how strongly the young Wallis informed the making of the movie throughout the filmmaking process. All of this said, I can’t claim this was the best film I’ve seen all year. At times I was unsure what exactly the film intended to be. There were portions that dragged somewhat for me (even at a refreshingly short running time of an hour and a half) and there are some downright peculiar characters that live in that Delta. Nevertheless, there were enough elements that worked together in such a way that the film ultimately got under my skin. The magically moving performances of both Wallis and Henry (in particular a scene between the two of them that left nary a dry eye in the theater), the majestic southern-tinged soundtrack that filled my every pore, and the inspiring message of hope it leaves, all combined to make it worth it in the end. This entry was posted in Movies and tagged Bathtub, Benh Zeitlin, Dan Romer, Dwight Henry, entertainment, Hurricane Katrina, Hushpuppy, Independent Film, Louisiana Delta, Movies, Quvenzhane Wallis, Sundance, Wink by Missy Krehbiel. Bookmark the permalink.